You want to sleep peacefully at night knowing you are prepared for life’s financial challenges and are working to achieve your goals. Midwest Community gives you a variety of savings tools to prepare for emergencies that pop up, plan for a special trip, or achieve your dream of owning a home or financing your child’s education. The right savings tools plus your hard work and preparation equals financial freedom! A basic Savings Account is a great way to put away money for life’s unexpected challenges. An HSA is a compatible option to work along with High Deductible Health Plans (HDHPs). Looking for another convenient, automatic savings tool to add to your savings tool belt? Once you enroll in Piggy Banking every Debit Card purchase you make is rounded up to the nearest dollar. 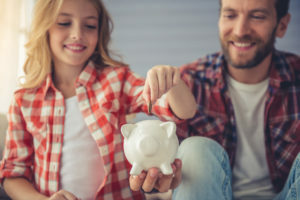 An awesome, convenient tool for new savers, savers with multiple saving goals, or savers who need a little help sticking to a savings plan! Direct deposit your payroll and we will automatically split your deposit to your Checking, Savings, Club, and Miscellaneous Accounts. We do the work for you! Rest easy knowing your savings are building automatically without the temptation of spending the funds!